Australia captured my heart over 5 years ago when I set off on my dream trip. My life was squeezed into just a backpack and I had my best friend by my side. I never quite forgot about how life there made me feel. I fell so in love with the feeling that I’ve been back 5 times to continue my hopeless love affair with the land of golden beaches, laid back living and Tim Tams. I even launched WMGT adventures down under in January 2019 and re-lived the discovery of my 3 favourite east coast spots through the eyes of new explorers. I have no doubt that I’ll be booking my flights out of the depths of the English winter again very soon to see 2020 in in the sunshine. Even though I’ve tended to head back to my favourite spots on each trip (these are the places where my friends are etc etc) I always make sure I explore a little new land, to create more content for you guys but also to make the most of flying such a distance and being surrounded by incredible amounts of beauty. 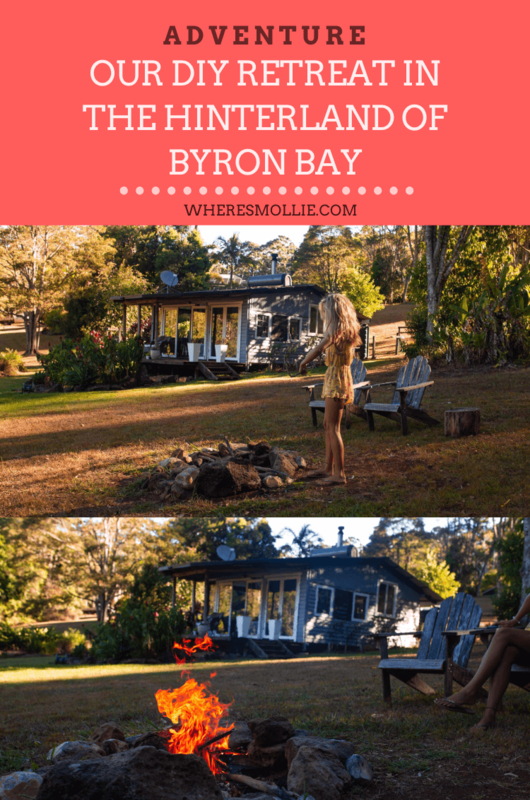 Last year I hopped into the Outback with Topdeck to discover Uluru, I picked up a camper van and did a road trip down the great ocean road and this year I headed out into the Byron Hinterland to live in the lush greens away from the tourism for a few days. Drive to our Airbnb and have a lovely little eat sleep workout and rest routine. P.s. Apologies for being a little late with this post. So many of you were asking for the accommodation link etc at the time but I dove straight back into a crazy work schedule after this trip and have only just gotten around to sharing this adventure. Some would say I have a great eye for Airbnbs. I would agree with those people. I’ve seriously found some gems and this one was also up there with the best.The Airbnb photos really didn’t do it justice tbh. As we wheelbarrowed our belongings from the van and caught first sight of the cottage, we both dropped everything (including our jaws) and ran inside like giddy school girls. We were beaming with smiles the entire time we were there. Top tip: Use this link to get £25 off your first Airbnb booking! Book this particular Airbnb cottage here. 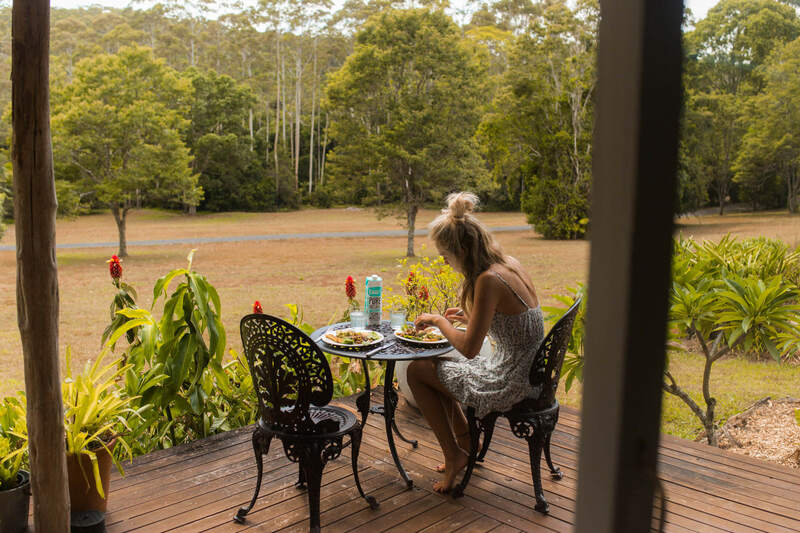 The cottage was nestled between the lushest of greens and wildlife in Nightcap National park about 45 minutes from Byron centre, inland. 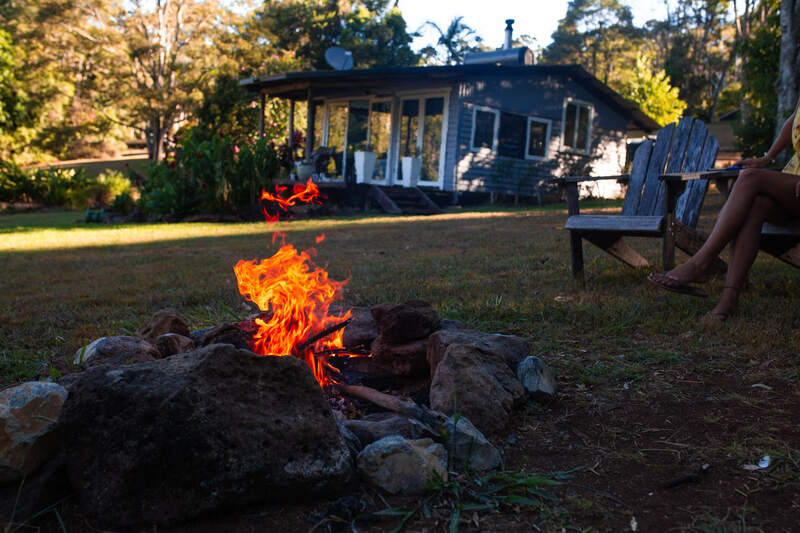 Our lodge was one of a few, built on this expansive plot of land by owners Fraser and Sarah who actually made the move up here from Manly to escape the relentless pace of the city. They had a dream and now they’ve turned it into everyone’s else’s too. They’ve kitted out this particular retreat with all the mod cons that cushion your days with luxury but they have also kept it rustic, pure and very at one with nature. 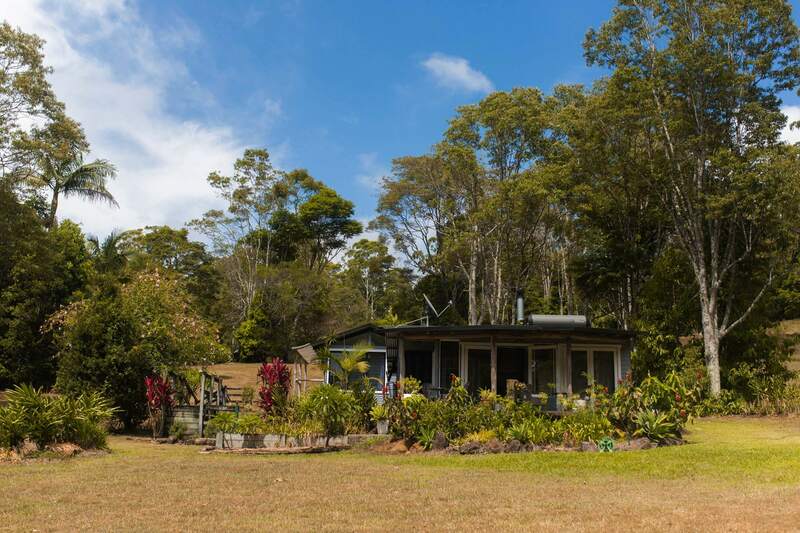 Look over the gardens from the freestanding bath, cover yourself in natural products, read your book on the patio, lose yourself in a board game, watch a movie, wander the forest in search of the koalas so often sat in the trees here. That’s without even leaving the Nightcap ridge land. Beyond there are waterfalls, hikes and more to explore, all of which is listed by Fraser in one of the many leaflets and documents left on your table to enhance your weekend away. But honestly, we just moved from the bed, to the sofa, to the patio to the yoga mat, to the bath and back to bed again. It was glorious. We bought enough food to last all 3 days and we even opted for Fraser and Sarah’s homemade vegetable curry cooking on the campfire with the most delicious cheese naan to accompany it. This is available on request when booking. With low light pollution and just the sounds of the birds around you, sat outside the cottage with the camp fire and a hot chocolate is the best place to watch the stars. I will definitely come back here for another little reminder of the simple life and if you get a chance to beat me to it in the meantime – I wouldn’t hesitate. It gets booked up quick! Book your stay at Nightcap ridge in this lodge here. See all my Byron Bay guides here. Have you explored anywhere beyond Byron Bay? I’d love to explore some more? Pop your recommendations below!